While I'm working on the last couple of installments of the SPICE series, I thought I'd take a little break. TGIMBOEJ stands for "The Great Intermet Migratory Box Of Electronic Junk." (image comes from their wiki). It's a neat idea where various boxes of gadgets, windings, whatzits, and thingamajigs get sent around between random people who sign up to receive it. They take stuff out, put cool stuff in, and send it onto the next vic--err, recipient. 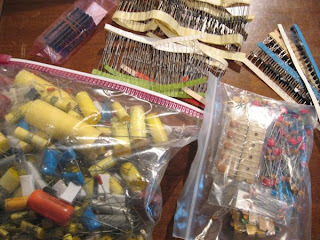 So far I've purchased a giant bag of about 300 ceramic caps, 300 regular caps, a bazillion zener diodes (18V and ... I don't remember what the others were), a boat ton of 2N4401 transistors, a pile of 1N4004 rectifier diodes. Some of those giant yellow capacitors are really cool looking. I have no idea how/if I am going to ever use them, unless I make some really funky looking BEAM robots. I will save some of these for the box if/when it arrives. I don't need all those zeners to make power supplies, just a few... likewise the 4004's. I've also got a box of parts from dismantling broken inkjet printers. 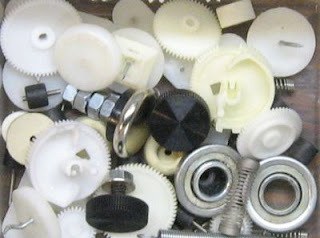 Some great motors, encoder wheels and sensors, and gears and whatnot. Would love to hear from you--what's your electronic miscellaneous box look like?